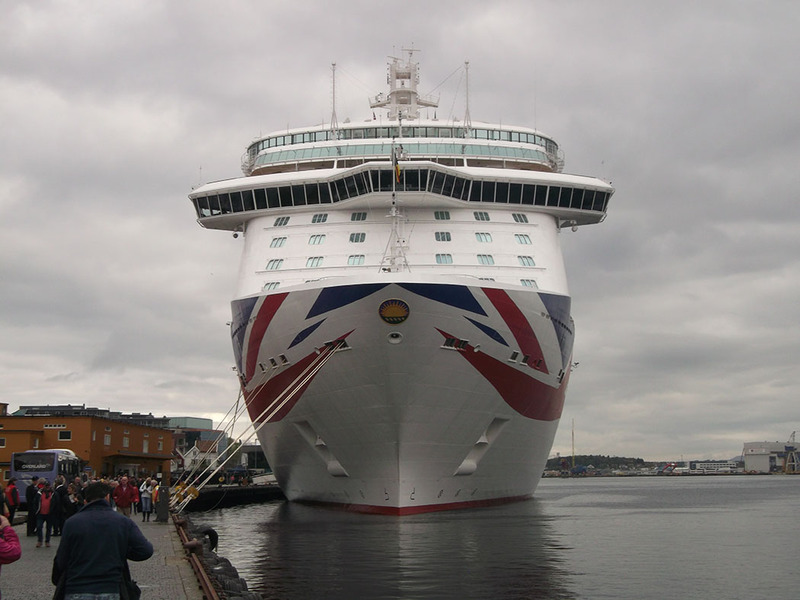 We arrived at brand new Britannia by P&O cruises in Southampton docks on the south coast of England on a sunny May morning. 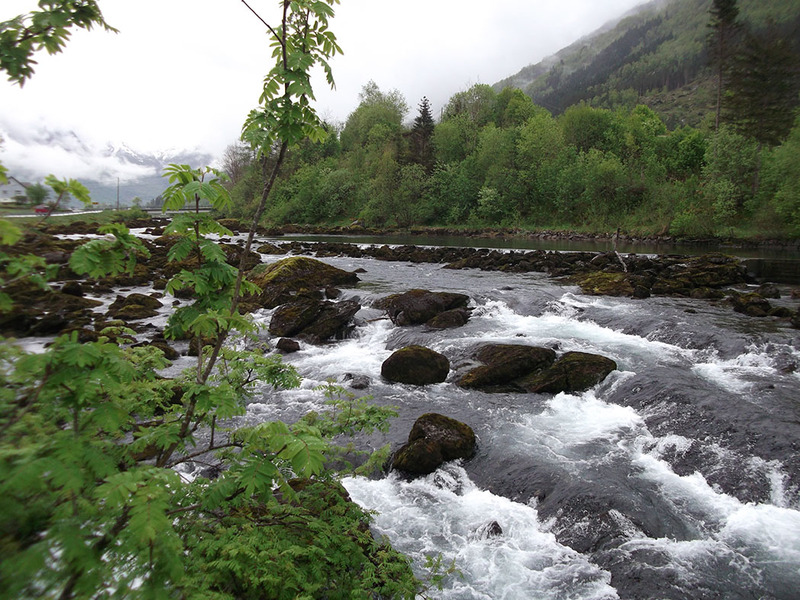 Our impending trip was a tour around the Norwegian Fjords. 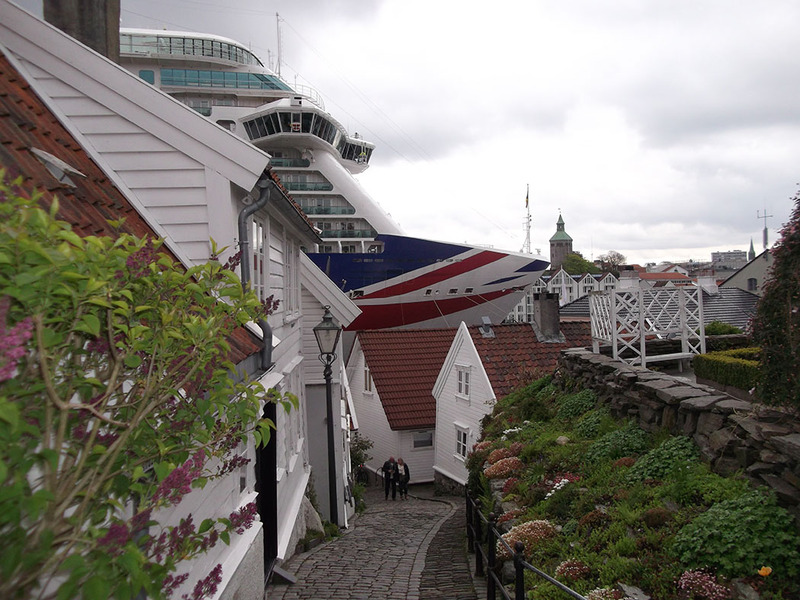 The ship towered above us, she is gigantic and looked inspiring with her white hull and clean lines. We couldn’t wait to get on board. Amazingly, with the large number of passengers, we were quickly and efficiently relieved of our suitcases, checked in, and embarked. 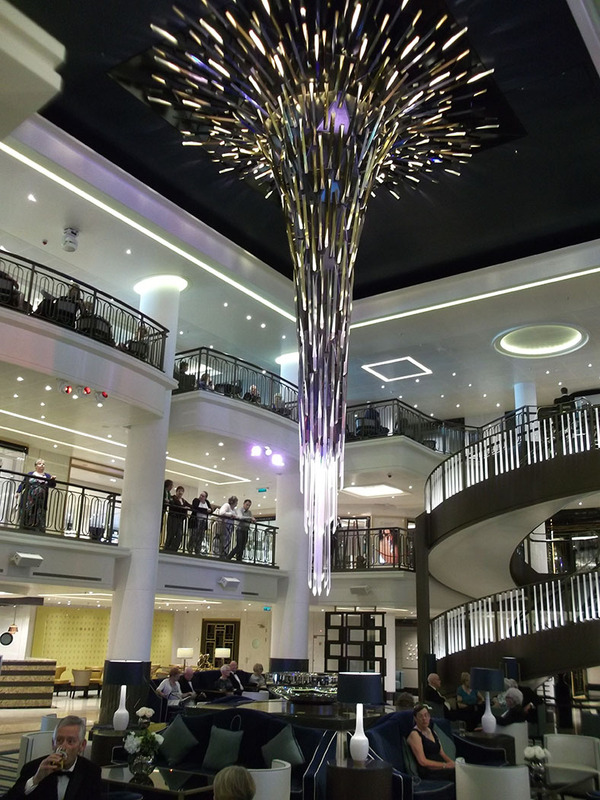 The first thing you see is the stunning 3-tier atrium featuring a part-chandelier, part-sculpture, centre-piece called the Star-Burst. It reminded me of a giant ever-twinkling stalagtite. The Star-Burst creates an ever-changing view as it glitters in the light and casts a colourful glow over the space below. Britannia has benefitted from having one designer in charge of the entire concept and the whole area has the wow factor, and is similar in feel to a grand hotel lobby or the Café de Paris in Monaco, with plenty of luxurious soft sofas and thick rugs dotted around. As members of the top tier of P&O’s Peninsular loyalty club, we were greeted and escorted to the Meridian Restaurant for a welcome glass of bubbly and a lovely lunch (sea-bass and chocolate mousse) with plenty of wine to wash it down. 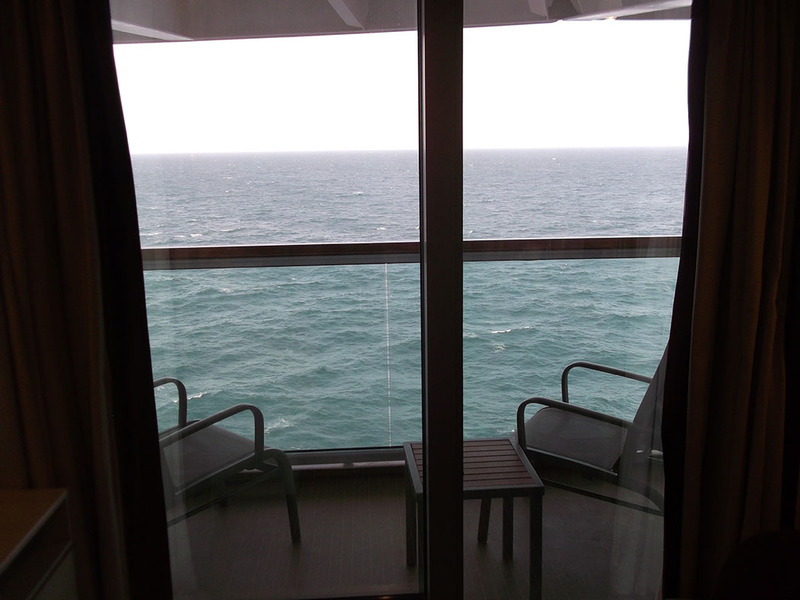 Next to find our cabin, we entered on deck 5 and the cabin was on deck 15 so we had to find the lifts! Our cabin was a superior deluxe balcony cabin (317sq ft). The cabin was really stylish and contemporary in restful shades of beige and dark green with a lounge area with sofa, chairs, and a coffee table. It had a cosy feel with plush soft furnishings and very comfortable Sealy beds (king-size) which ensured a perfect night’s sleep. The bathroom was compact but well-designed with lots of mirrors a full length bath (rare on modern cruise ships), and delicately scented White Company amenities. Flowers (orchids and a gazania), champagne and chocolates awaited our arrival. 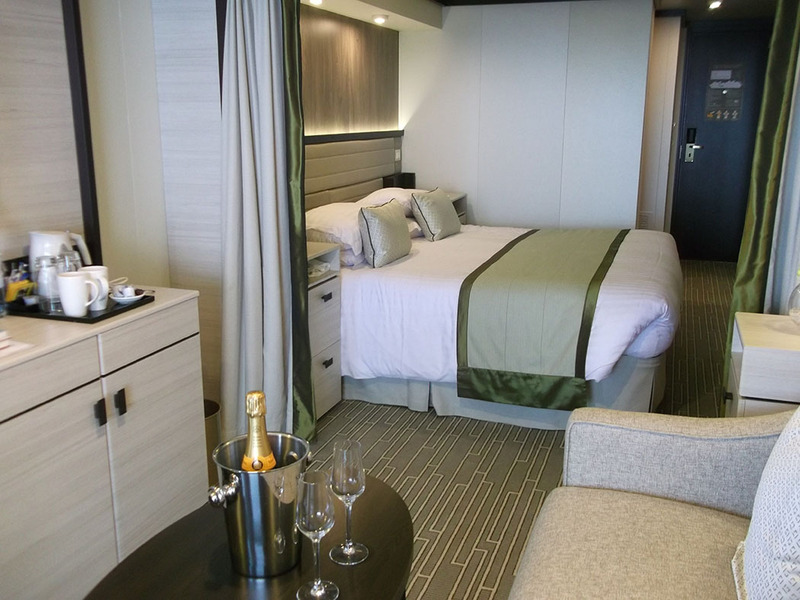 In addition, the deluxe cabin is equiped with bathrobes and slippers, atlas, binoculars, and a fruit basket. 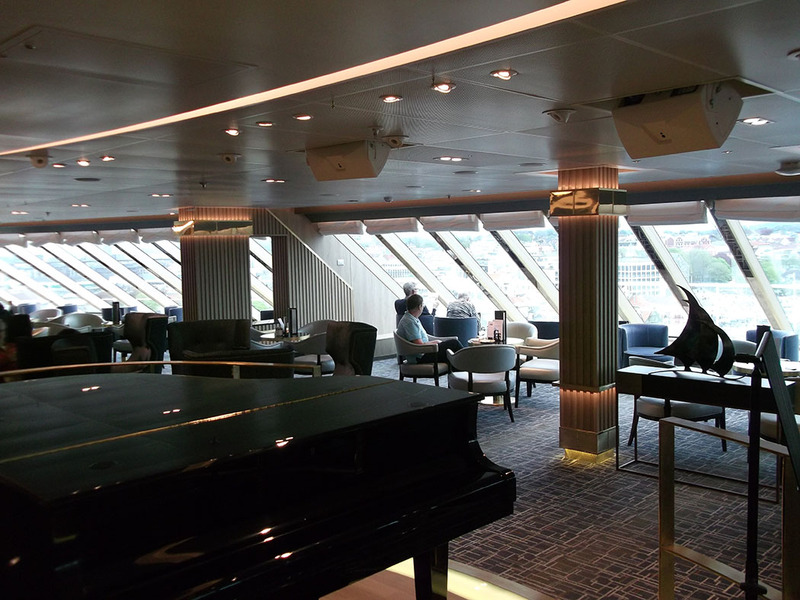 We had two large flat screen TV’s and tea/coffee making facilities (also rare on modern cruise ships) and the cabin was one of the quietest we have ever experienced. The Indian cabin steward (Kevin Keegan?) was excellent and fulfilled our requests with a beaming smile and greeted us by name. 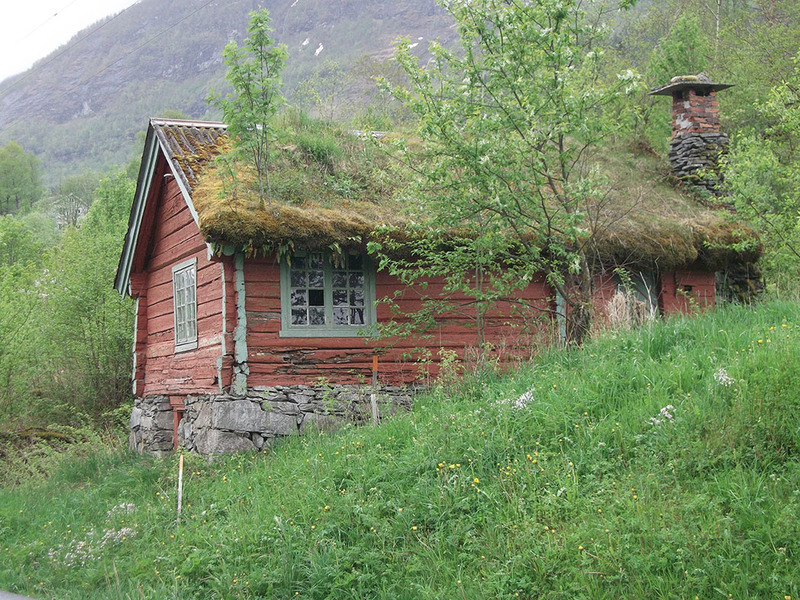 The spotless cabins are serviced twice daily, with a turndown service and pillow chocolate in the evening. To pre-order in-cabin breakfast every day, there is a card in your cabin which you fill in and place on the door handle as you retire for the night, I can report that every breakfast was on time and correct, no mean feat with 3,600 passengers on board. 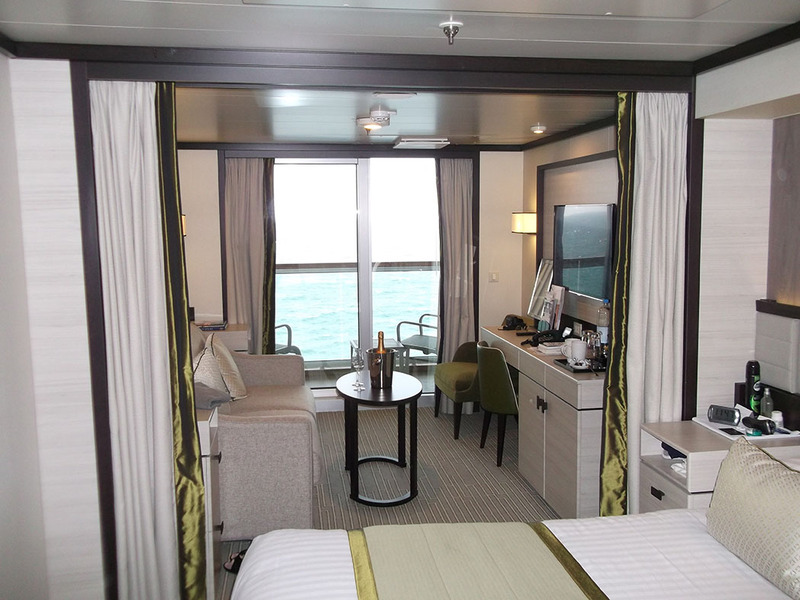 The only design downside was that the deluxe balcony cabins located on deck 15 (A deck) have an overhang from the deck above and which tends to shade the cabin balcony. 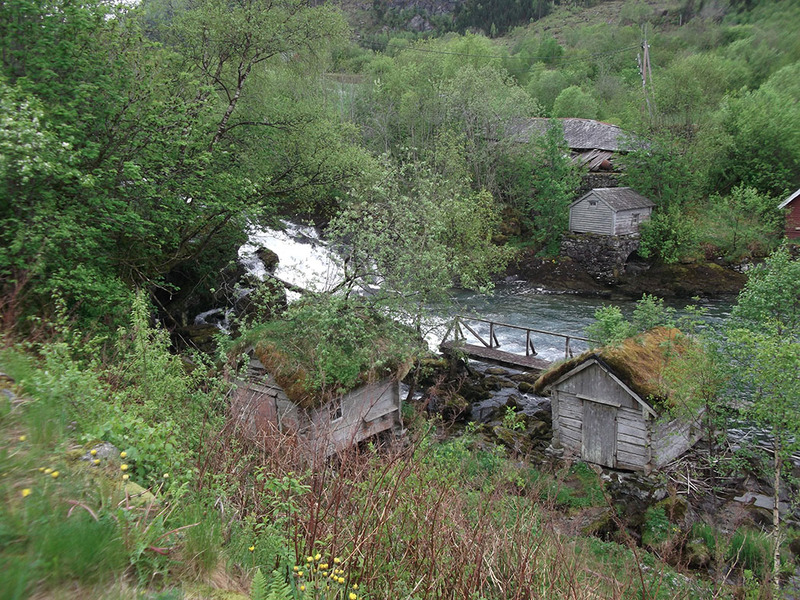 I would recommend a cabin on B or C deck where you should get more sunshine on your balcony. We were lucky that the sea was generally calm, however, with a ship this size, when we did have a few waves you didn’t feel any movement at all. 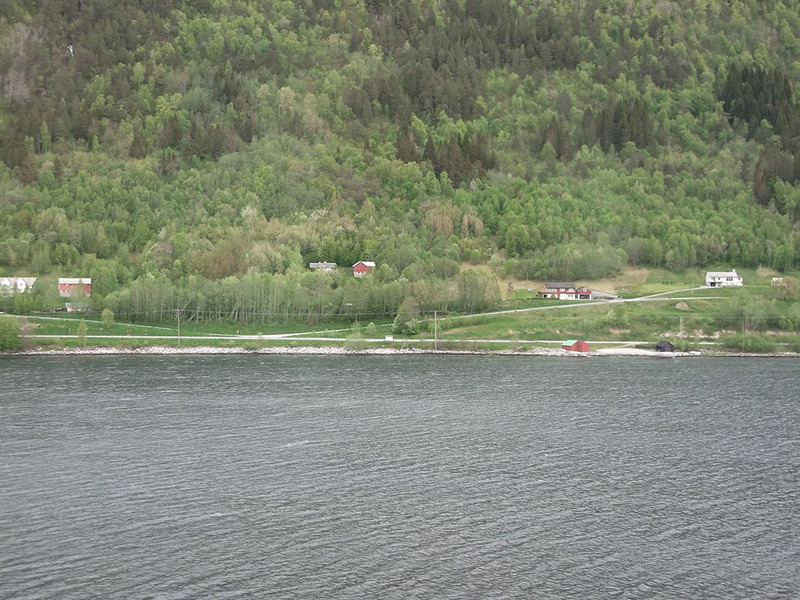 We were on a 7 day “The Fjords” cruise to Norway in May, the temperature hovered around 10°C, so you needed thick anoraks, woolly hats and gloves.. 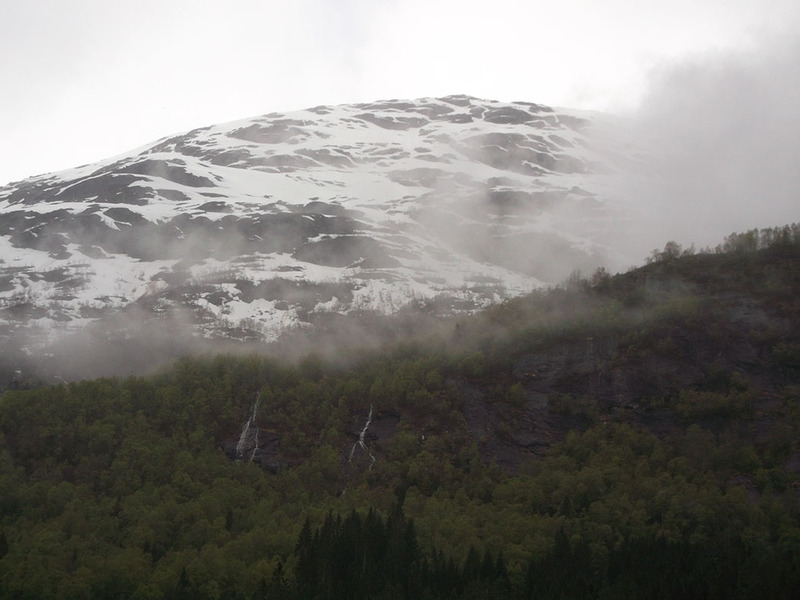 However the waterfalls were huge cascades, and the mountains were snow-covered almost down to the fiords – spectacular! The Captain’s Welcome Reception was in the stunning atrium, the perfect party venue, surrounded by two tiers of galleries. We sank into the soft sofas beneath the Star-Burst, and sipped bubbly with everyone in their best bow ties and ball gowns. This was followed by a lavish dinner in the Oriental Restaurant featuring treats by Marco Pierre White. The night of celebration continued with ballroom dancing in the Crystal Room or a show. 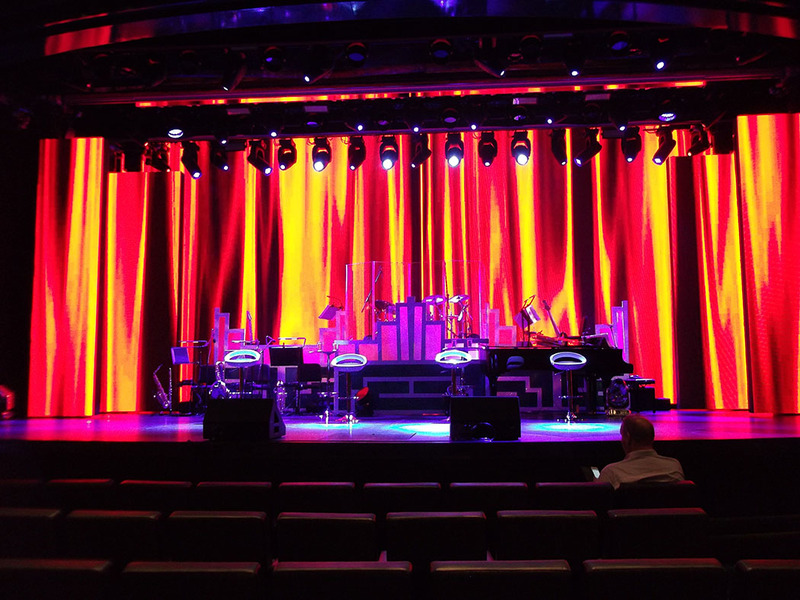 There are 9 entertainment venues on board. The theatre featured a full LED wall with amazing effects, the three shows (Britannia, Once upon a time, and Gravity) were an extravaganza of dancing, music and light. 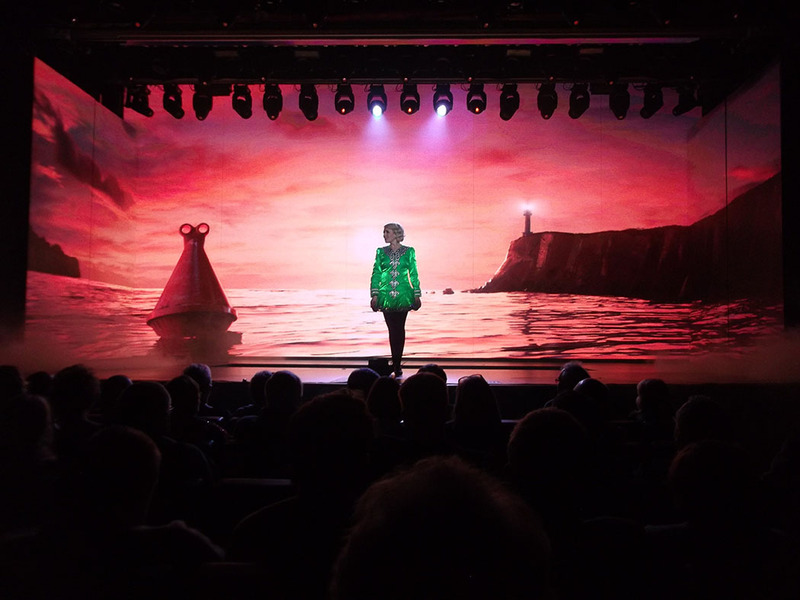 These shows would rival anything in the West End, and are more spectacular than on the other P&O ships. The theatre is not completely tiered, so for the best seats you need to go about 45 minutes before the show. The Live Lounge has different cabaret acts every night. 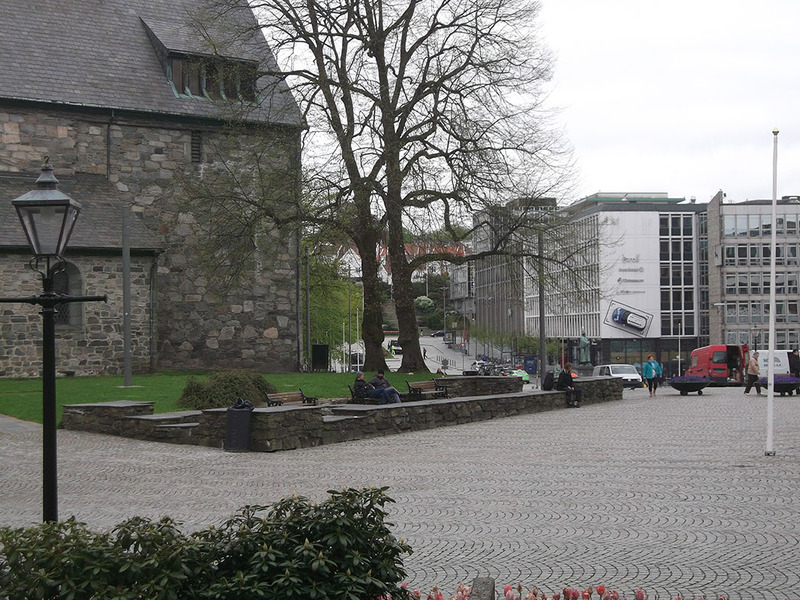 This is a delightful live entertainment venue for dinner and a cabaret show followed by dancing. 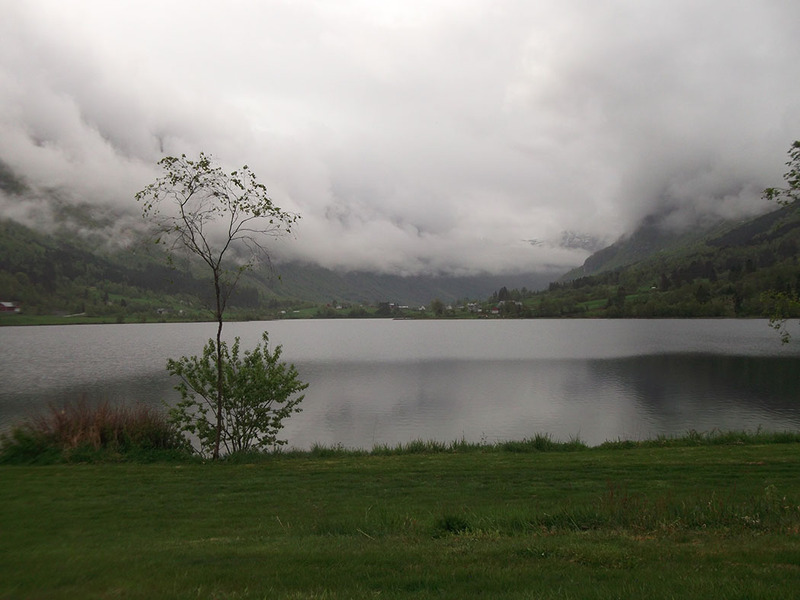 It was fully booked (as were the exotic restaurants) by the time we discovered it. 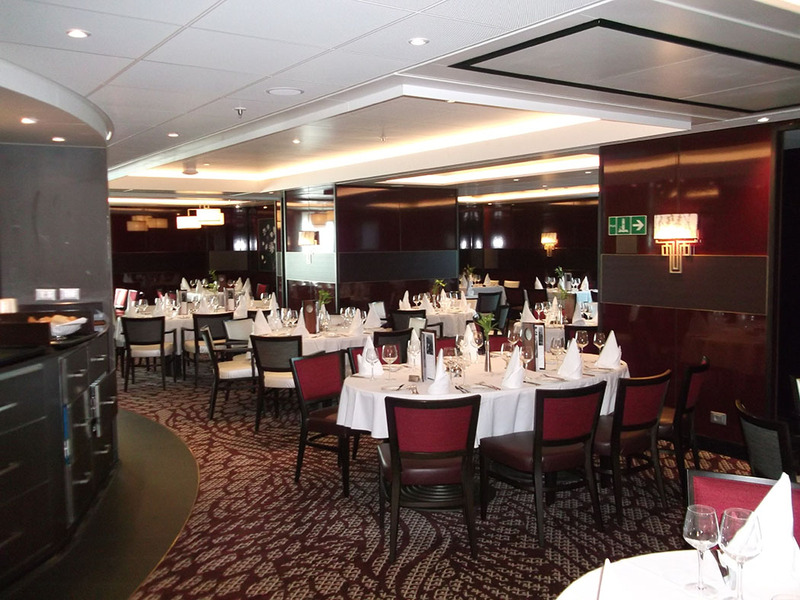 It is probably wise to book the restaurants online before your cruise, if you want to secure a meal is a specific high end restaurant on the Britannia. This is a multi-purpose TV studio, that doubles as a cinema and a venue for guest speakers and cookery demos, a hands-on cookery club and radio plays. There are 13 restaurants and eateries and 13 bars on board. 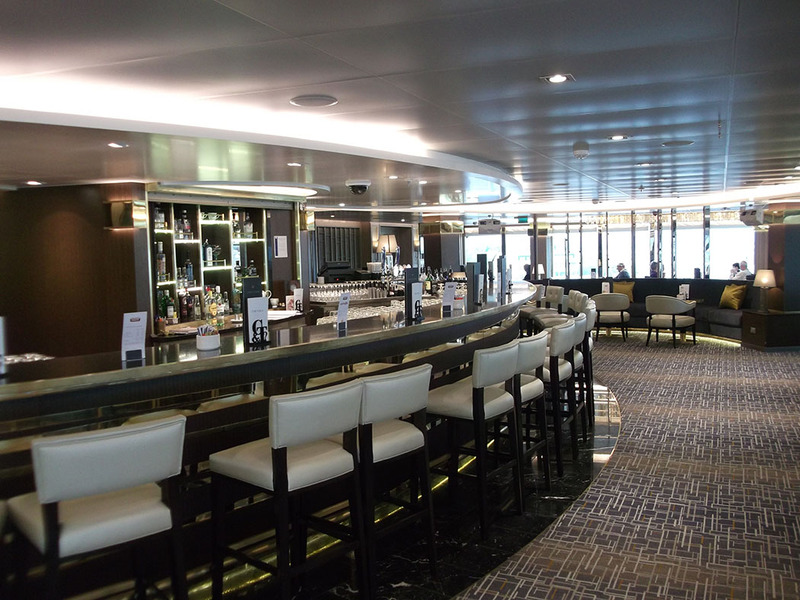 My favourites are the Crow’s Nest lounge which has a 180 degree view at the front of the ship, stunning décor and ambience, and serves 20 different brands of gin. The Sunset Bar at the other end of the ship has secluded couched snugs surrounded by (plastic) greenery and overlooking the swimming pools. Both are delightful spaces to relax over a friendly conversation and a cocktail. Food is always good on P&O ships, but they have pushed the boat out with 4 big-name chefs. Sindhu serves Atul Kochar’s subtly spicy dishes with a modern twist in a stunning space in which the lighting and sculpture combine to give an exotic ambience. Eric Lanlard’s afternoon tea was utterly decadent and indulgent with crazy confections. The Glass House (Olly Smith) is a sophisticated area of old-fashioned glamour, welcoming and restful with a wonderful selection of wines. Our delicious Alaskan crab sandwich, which came tastefully arranged on a board with salad and sweet potato chips, but no bread! We enjoyed sitting in Java Cafe on a sea day in the Atrium, watching the world go by and enjoying a coffee and a delicious cake. The crew on board were very friendly and helpful, there was surprisingly little queuing if you thought ”out of the box” and did things when the majority were busy eating!! We really didn’t feel crowded by the numbers of cruisers. Tranquil and sensuous, the Spa is a modern and spacious with muted décor. The Retreat is a luxurious area at the top of the ship, that you pay for, with sumptuous sofas and recliners, 2 whirlpool spas, and a view of the sea. On a sea day it would be a welcome escape from the busy pool area. Get off the boat early in port. Go to the early shows. Eat at the Horizon Buffet at off-peak times. Go early for Freedom dining. It is unlikely that structural changes will be made to introduce a midships stairwell, this coupled with the small size of the lifts was the main passenger gripe. The stairs at either end of the ship are a long walk between and it is frustrating to have to wait for a lift to return to the cabin. With 15 passenger decks, it could take 5-10 minutes to walk all the way down. The two outdoor swimming pools are lovely, but inadequate for the number of passengers on a sea day. 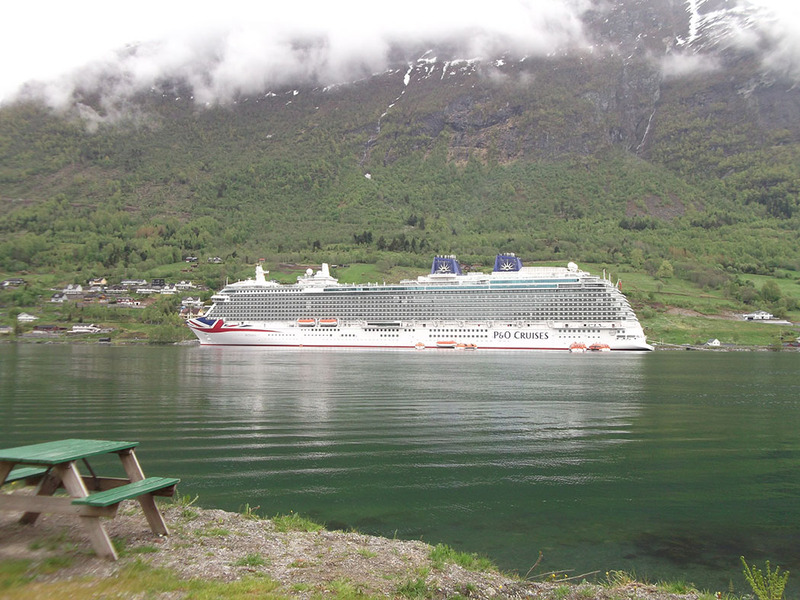 You need to take a cruise with lots of ports, or a fly-cruise, to enjoy her at her best. 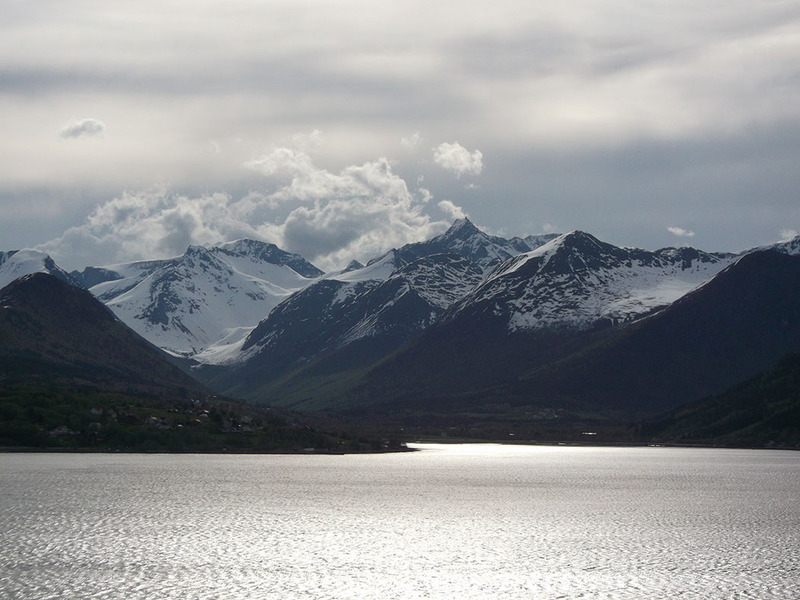 The snow capped Fjords were stunning as expected and swamped even our massive super ship, but they were secondary to the Britannia which really is a destination in herself. Sail in her, dine in her, enjoy shows in her, sleep (well) in her and occasionally get lost in her. My lasting memory will be sitting under the twinkling lights of her super-staligtite light instillation sipping a cocktail- such fun!